If you have opened just about any LGBT magazine in the past 20 years, you’ve definitely seen the enticing and inviting ads for Atlantis Events and Atlantis Cruises. As the largest gay and lesbian tour operator in the world, Atlantis Events makes dream vacations a reality for over 25,000 people each year. We asked Atlantis Events V.P. of Marketing Patrick Gunn to tell us more. How can you describe Atlantis Events in one sentence? Atlantis Events is the largest gay and lesbian tour operator in the world, hosting over 25,000 guests annually on our all-gay cruises, and gay resort vacations. What can you tell us about Atlantis Cruises for 2017? We invite your readers to sail into 2017 on some of the most fabulous cruise vacations in our 26-year history. It’s a great time to plan their next escape with some awesome deals on our newest cruises. An Atlantis gay cruise is about so much more than a vacation – it’s a chance to visit new places, experience new adventures, discover new ways to play, and become part of a unique community filled with friends old and new that simply doesn’t exist anywhere else. For our very short time together, we become the majority and revel in the joy and strength of this unique experience. Atlantis is dedicated to absolute relaxation and incredible fun. Our cruises are about newness, romance, and fresh perspective. They’re about exploration and adventure, about escaping normalcy by acting spontaneously — going places you never thought you would go and doing things you never thought you could do. They’re about waking up next to your husband, long-time partner, or short-term fling and realizing, together, that you’ve woken up in a different and fascinating port. 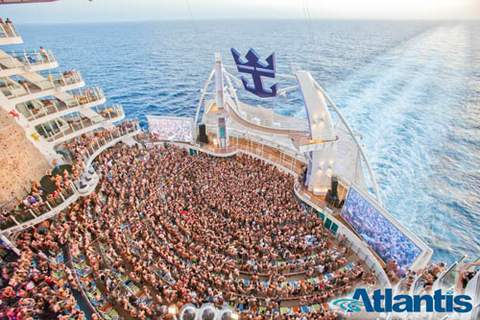 Mostly, though, our cruises are about having the time of your life in ways you never imagined! Best of all, we’ve kept our rates for 2017 the same as 2016, and most are even lower than ten years ago. It’s our way of saying thanks for the support of our loyal guests with amazing deals on the world’s best gay vacations. All of our 2017 cruises (except for our Mexico cruise set for October) are listed on our website. What can you tell us about Atlantis Resorts and 2017 events? Resort vacations is what started it all. 26 years later, we are ready to launch two amazing resort vacations. At Club Atlantis Cancun, we take over the entire 30-acre Club Med Cancun for a week of sunshine, luscious private beaches, endless activities, exciting sports and so much more. There’s no better place in the world to relax in total comfort, learn a new skill, challenge yourself, cut loose, or just spend time with friends old and new. All for one low all-inclusive price! At Club Atlantis Vallarta, we take over the entire 5-star resort to create a relaxing and friendly all-gay beach vacation like no other. Start with our architecturally stunning 5-story resort facing one of Mexico’s most beautiful bays. Each year, our most popular premium resort receives upgrades that continue to transform the magnificent Hard Rock Vallarta. In 2016, the new Rock Spa opened to rave reviews. Atlantis was the first gay vacation company to charter an all-inclusive resort in 1991. Our resort vacations offer a unique experience that you don't find on other vacations. The relaxed pace and intimate scale of resort life make these vacations the more laid-back version of the Atlantis experience. Luxurious, premium, all-inclusive resorts with lush private beaches and world-class facilities throughout set the stage for a week of relaxation, friendship, romance and fun. Our resorts are true premium vacations, with five-star accommodations, food, and facilities throughout. Most importantly, you'll find that a Club Atlantis vacation is truly the best value in all-gay vacations today. Absolutely everything is included, for less than the cost of our least expensive cruise ship stateroom. Who attends Atlantis Cruises and Atlantis Resorts? Is it a good fit for everyone regardless of age and body shape? There's no typical Atlantis guest. All Atlantis vacations are roughly half singles — half couples, representing a broad mix of ages, with a large concentration of guys from their early 30s to early 50s. Our guests come from all over the world, from small towns and big cities, with interests and experiences as varied as the gay community as a whole. You'll find introverts and extroverts, party boys and bookworms, young hotties and interesting elders, all mingling and having a good time. About 5-10% of our guests are women, and always welcome to be a part of our family. With hundreds or thousands of guests on each Atlantis vacation, you're sure to find people you'll feel comfortable with. Whether you're traveling solo, with a partner or a group, our vacations are uniquely conducive for reconnecting with old friends and making new ones. We make it easy for you in every way. What can you tell us about the history of Atlantis Events? Atlantis actually began with a resort vacation. In 1991, Atlantis Events held our first all-gay resort event with 300 guests at a Club Med Resort in Playa Blanca, Mexico. What started with the very simple idea of "a gay week on the beach with friends" has blossomed into a company producing all-gay cruise and resort vacations all over the world. Today, we are the largest company in the world dedicated to creating unique vacations for the gay and lesbian community, hosting some 20,000 guests a year. Rich Campbell founded Atlantis over 25 years ago, looking to create a unique place for the gay community to come together to play. Atlantis is dedicated to the premise of creating a welcoming community that simply doesn't exist anywhere else: a place where you can relax, be yourself, and have fun in ways you never imagined. As the largest gay and lesbian tour operator in the world, Atlantis Events makes dream vacations a reality for over 25,000 people each year. Maybe it’s your turn to enjoy one! For more information, visit http://atlantisevents.com or phone 800.6.ATLANTIS (628.5268).